Civil Protection groups in Chiapas report that a total of 9,000 homes in that state were damaged by the 6.9 magnitude earthquake that struck the region on 7 July 2014 (see below). Three people lost their lives as a result of the ‘quake: two in Hixtla and the other in Mapastepec. Minor damages have been reported for various public buildings including the Town Hall in Tapachula, primary schools in Tapachula and Tuxtla Chico, two health care centers in Villacomaltitlán and the municipal market in Escuintla. A total of 38 municipalities in Chiapas have now been formally declared “Disaster Areas” which gives them access to funds from the federal Natural Disaster Fund. The municipalities are Acacoyagua, Acapetahua, Amatenango de la Frontera, Arriaga, Bejucal de Ocampo, Bella Vista, Cacahoatán, Chicomuselo, El Porvenir, Escuintla, Frontera Comalapa, Frontera Hidalgo, Huehuetán, Huixtla, La Grandeza, Mapastepec, Mazapa de Madero, Mazatán, Metapa, Montecristo de Guerrero, Motozintla, Pijijiapan, Siltepec, Suchiate, Tapachula, Tonalá, Tuxtla Chico, Tuzantán, Unión Juárez, Villa Comaltitlán, Altamirano, Ángel Albino Corzo, Comitán de Domínguez, El Parral, La Concordia, Tuxtla Gutiérrez, Villa Corzo and Villaflores. A strong earthquake has rocked Mexico’s southern state of Chiapas and the neighboring San Marcos region of Guatemala. There are two reported fatalities in Chiapas, while in Guatemala casualties were restricted to a new-born baby, tragically killed by falling debris. About 300 homes in 15 municipalities in Chiapas are reported to have been damaged. The earthquake, at about 6:30 am local (Chiapas) time, registered 6.9 on the Richter scale, though the US Geological Survey had earlier reported it as magnitude 7.1. The epicenter of the earthquake was 2km north-northeast of Puerto Madero, Chiapas, very close to Tapachula. 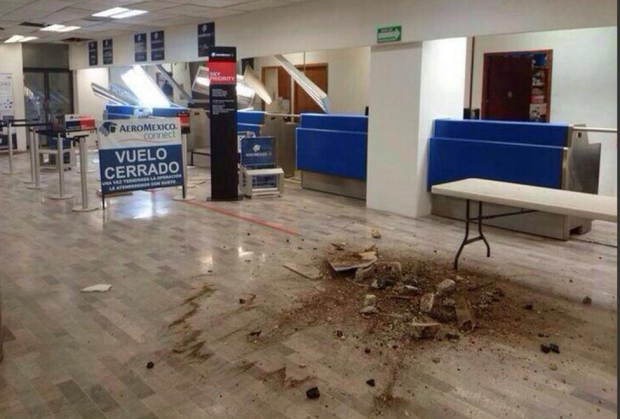 The airport of Tapachula, close to the Mexico-Guatemala border, is now reported to be operating normally, having sustained minor damages (see below) and having been briefly closed for inspection, with no flights allowed to land or take off. A sequence of images posted by Mexico City daily Milenio shows some of the damage and devastation caused by the earthquake. Damage is also reported to many homes in Tapachula, and the town market in Huixtla (north-west of Tapachula) has been partially closed due to structural damage. We will update this report as more information becomes available. Excerpts from Geo-Mexico Comments Off on Which tectonic plates affect Mexico? The theory of plate tectonics suggests that the earth’s crust or lithosphere is from 5 to 65 km (3 to 40 mi) thick and divided into about a dozen large tectonic plates, tabular blocks that drift across the Earth in different directions and at various speeds (up to a few centimeters or inches per year), probably as a result of thermal convection currents in the Earth’s molten mantle. Most plates consist of a combination of both ocean floor and continent, though some are entirely ocean floor. Each tectonic plate is moving relative to other plates. The movements are not independent because the plates smash into and scrape against one another. Areas in the center of tectonic plates, far from the boundaries, have relatively little seismic activity, but the boundaries between plates are seismically very active, creating earthquakes and volcanoes. The level of seismic activity depends on the relative speed and direction of the plates at the boundary. There are three distinct kinds of boundaries between plates. At divergent boundaries, along mid-ocean ridges, plates are being steadily pushed apart, with new crust being added by volcanic activity to the rear of each plate as it moves. At convergent boundaries, plates collide and parts of the plates either buckle or fracture or are subducted back down into the molten mantle. The third kind of boundary is where plates are neither created nor destroyed but are moving side by side. 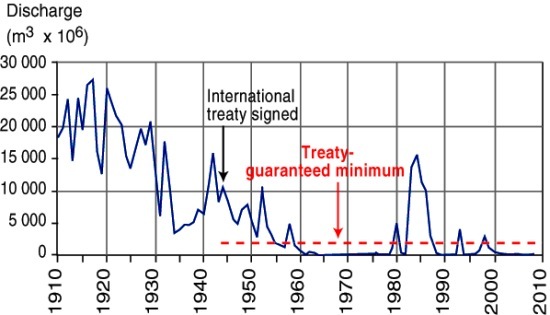 The resulting friction as they rub against each other can produce large earthquakes. While most of Mexico rests on the North American plate, it is also influenced by several other plates. The Baja California Peninsula is on the gigantic Pacific plate, which is moving northwest and under the North American plate. The intersection of these plates under the Gulf of California causes parallel faults which are part of the famous San Andreas Fault system. Thus, the Gulf of California is an area of heavy seismic activity. 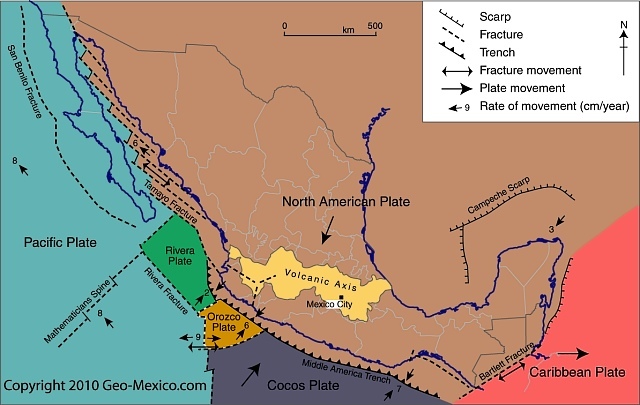 The small Rivera plate, between Puerto Vallarta and the southern tip of Baja California, is moving in a southeasterly direction and rubbing against the Pacific plate; it, too, is moving under the North American plate. The Cocos plate and tiny Orozco plate are ocean crust plates located off the south coast of Mexico. 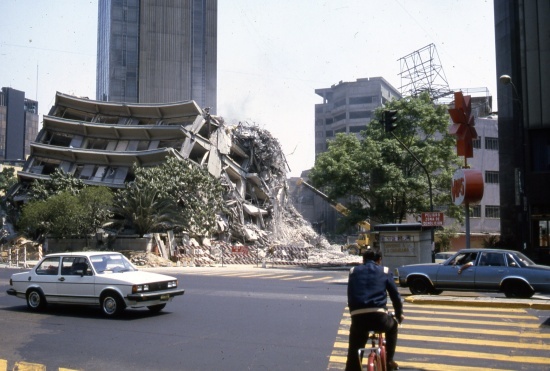 The collision of the Cocos plate and the North American plate has had several far-reaching consequences, including both the disastrous 1985 earthquakes that caused such severe loss of life and damage in Mexico City and the much more recent 2012 earthquake that, fortunately, was far less destructive. Given its strength (almost the same as the 1985 Mexico City earthquake), this latest earthquake could have been so much worse… but it appears that central Mexico escaped with only relatively minor damage. The earthquake happened 12:02 p.m. local time at a depth of about 10 km (6 miles), some 200 km (120 mi) east of the resort city and was felt as far away as Mexico City. The epicenter was close to the settlement of Ometepec, roughly midway between Acapulco and Oaxaca City. The USGS originally recorded the earthquake as a 7.6, but has since downgraded the magnitude to 7.4. Mexican sources say the earthquake lasted 2-3 minutes. Several significant aftershocks have been recorded since. The shaking was felt in Guerrero, Morelos, Puebla, Tlaxcala, Estado de Mexico, the Federal District and as far as Veracruz. 800 houses, in several municipalities, are reported damaged. The major damage is in the Costa Chica region of Guerrero. The municipalities affected include Ometepec, Tlacoachistlahuaca, Xochistlahuaca, Cuajinicuilapa, Igualapa, Azoyú and San Luis Acatlán. Personnel from Mexico’s armed services have established temporary shelters to house those that lost homes or who are considered at risk from aftershocks. Many families have opted not to return to their homes to sleep, fearing further quakes. 2.5 million people, mainly in central Mexico, lost electricity, but most had their power restored within hours. The earthquake triggered several small landslides on highways in Oaxaca. 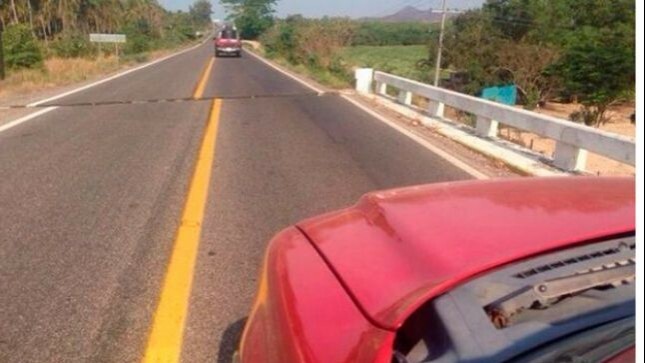 In addition, traffic flow was briefly interrupted on the Acapulco-Cuernavaca highway, at kilometer 251. Telephone service (including cell phone service) was briefly interrupted in several areas, while technicians carried out safety checks. Ay one point, more than 40,000 technicians were on standby. Water provision. The Chalco-Xochimilco aqueduct was damaged, affecting about 100,000 people who live in the Tláhuac district of Mexico City. Elsewhere, 200,000 residents of the Iztapalapa district had their water supply interrupted due to damage to the La Caldera aqueduct. In both cases, repairs are expected to be completed within 48 hours. School classes were suspended for the afternoon session in several places, including Acapulco, Igualapa, Cuajinicuilapa, Xochistlahuaca, Azuoyú, San Luis Zacatlán andOmetepec, and in Oaxaca City. In Mexico City, the seismic alarm system functioned and gave residents a few seconds warning before the quake struck. In the words of one Twitter user (@RodrigoEBR) “FOR THE RECORD: The Mexico City earthquake early warning system was activated just seconds before the 7.6 quake”. Shares in Cemex, Mexico’s multinational cement manufacturer, rose almost 4% on the day in late trading, as speculators bet on increased demand for cement and construction materials in the wake of the earthquake. According to the latest press reports, more than 32,000 homes and 1,057 schools in the states of Oaxaca and Guerrero sustained some damage as a result of the 20 March 2012 earthquake. This figure includes 30 schools in the Costa Chica region of Guerrero that will need to be completely demolished and rebuilt from scratch. As of 26 March the area had experienced more than 200 aftershocks of Richter scale 3 or greater. 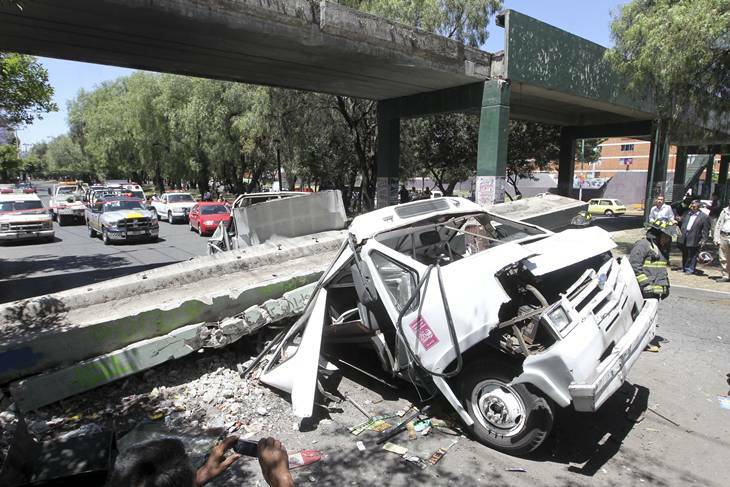 The insurance industry expects claims from the earthqauke to reach about 5.6 billion pesos [about US $ 440 million], with most claims expected from policy holders living in the Guerrero, Oaxaca, the Federal District, Puebla and Morelos. 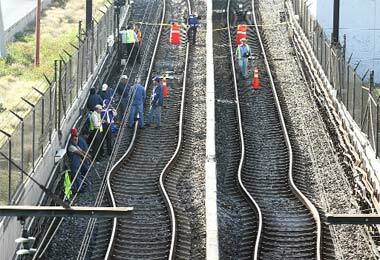 Damage in Mexico City included a section of line A of the city’s metro network (see image), where 100 meters of track between Santa Martha and Acatitla stations were buckled and have now been replaced. 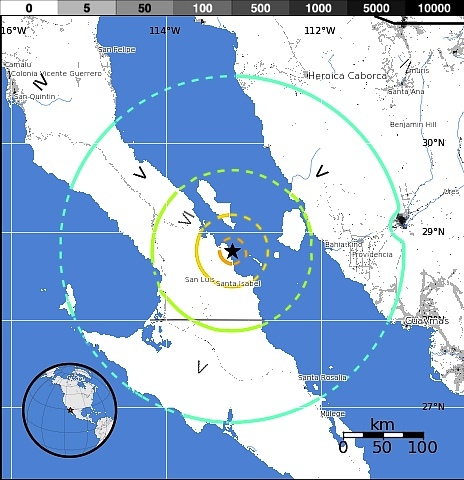 The 4/4/2010 (Easter Sunday) earthquake centered in Baja California really did not only shake the earth but also move it. What is even more amazing is that this may be one of the best documented examples of an earthquake in one country moving parts of a neighboring country. NASA has released data showing that the 4/4/2010 earthquake in Baja California moved the border city of Calexico in California. 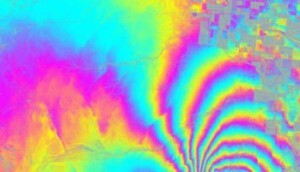 According to NASA’s analysis of radar data from research flights, the April earthquake moved the Calexico region as much as 0.8 meters (2.5 feet) towards the south. Further south, in Baja California, some parts of the ground moved up to 3 meters (10 feet). For a full explanation of the image, which shows an area about 20km east-west, by 15 km north-south, please refer to the original article. Other cities have also been moved by earthquakes. For instance, in the magnitude-8.8 Chilean earthquake of 27 February 2010 , the city of Concepción in Chile was displaced a whopping 3 meters (10 feet) west of its original position. Initial reports of the earthquake, which struck at at 15:40 Pacific time, are that the epicenter was about 160 kilometers south-east of Tijuana and that the earthquake occurred at a depth of about 10 kilometers. The shaking was felt in downtown Los Angeles. Press reports confirm two fatalities and 100 people injured, as well as considerable damage to some buildings in Mexicali. More than 5000 homes in the rural areas south of Mexicali have been badly damaged. About 25,000 people have received emergency shelter and food and other assistance.